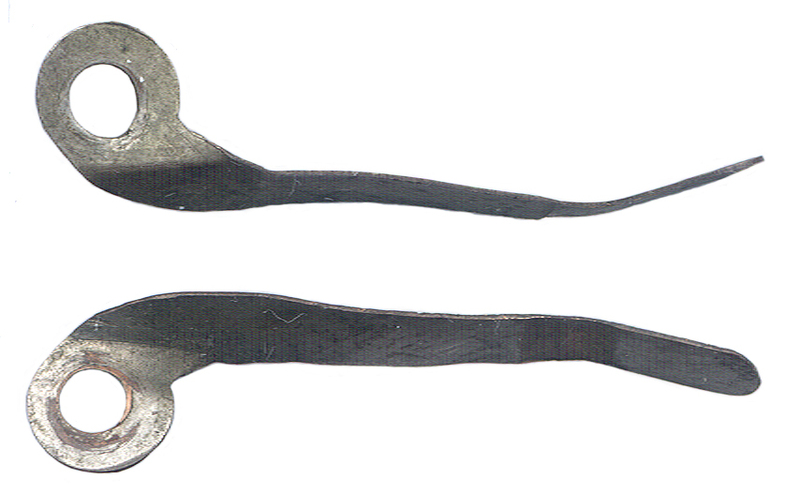 The early DC motors were two pole types. This electric motor is very similar to the Electro-magnetic Toy Engine. Three pole DC motors came a little later, like the Erector set Gilbert DC motor. 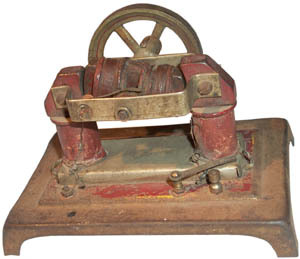 Prior to the rotating motors there were reciprocating motors that worked very much like steam engines. I heard from John P. that these were mainly used with the Weeden line of steam engines as DC generators. That makes a lot of sense since Weeden's main product was steam engines. Also he says to power this as a motor takes a lot of current (8 A @ 6 V seems high?). Some checking shows some minor problems. The brush holder has been removed from the frame and you can see a couple of sheet metal brushes. One of them is too weak to make good contact. Someone has put a tapered rivet to trap a wire and make contact to one of the brushes, that's OK, but it may also be shorting to the frame. That wire has a bad solder joint to the wire from the left coil going to the input terminal post on the left. Much better would be to run the wire directly to the terminal. There are a number of places where a bare wire is very close to or touching the frame. It's hard to see in this photo, but on the shiny metal plate between the two coils the word WEEDEN appears engraved into the metal. The two brackets that hold the shaft are non magnetic. This is correct otherwise they would be bypassing the armature. It's not clear if there's an iron bar between the sheet metal base and the sheet metal platform. 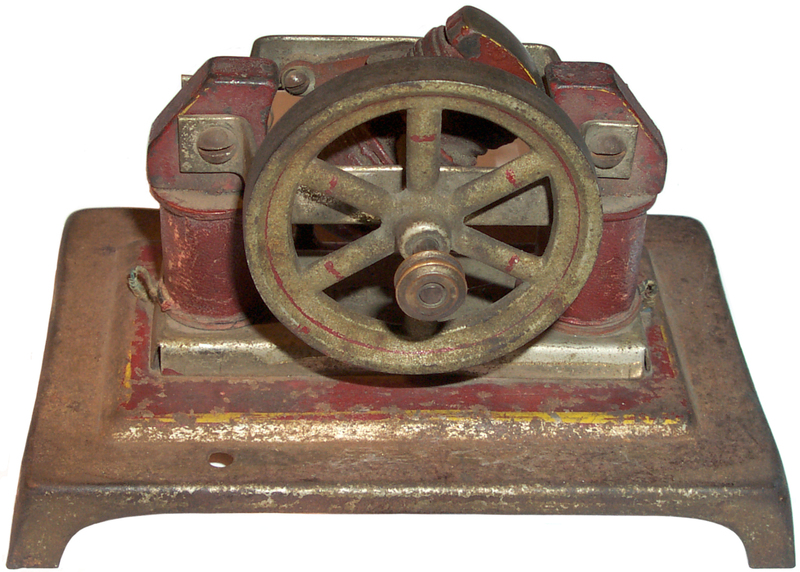 Weeden is known for their model steam engines. This electro-magnetic machine could be used as either a generator or as a motor in a steam engine setup. The brushes are bent so that the surface that rubs on the commutator is 90 degrees from the mounting surface. The material has arrived to allow making new brushes. If you have any exploded parts diagrams or other info on this toy DC motor please let me know. The way it was assembled does not look like a factory job. To order a 3" x 3" x 0.009" piece of phosphor bronze see the Phosphor Bronze Brush Kit. 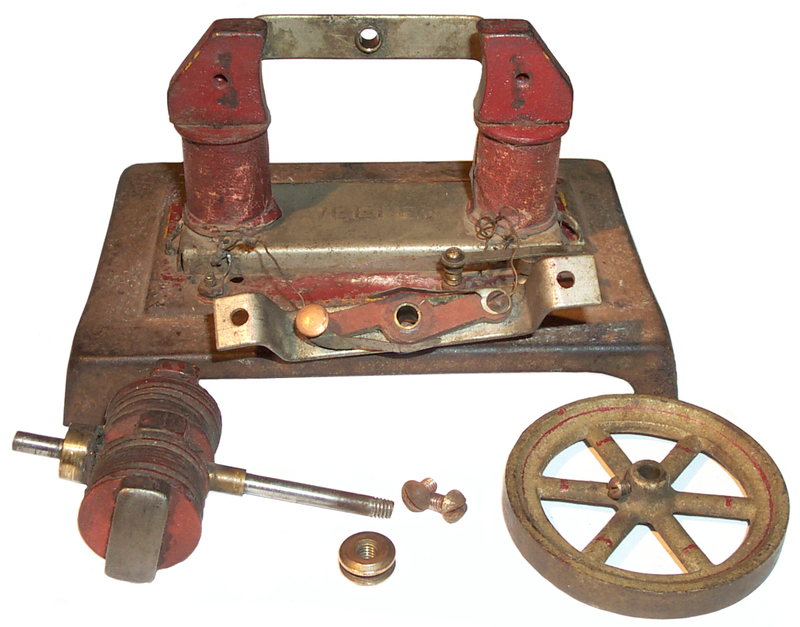 Carbide (acetylene) Gas Cannon - moved to Pop Guns web page. Gilbert DC 3-pole Electro-magnetic Machine - used with early Erector Sets & a larger small appliance motor (maybe also Gilbert).